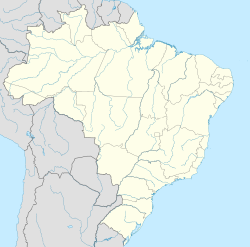 Santos (Brazilian Portuguese: [ˈsɐ̃tus] ( listen), Saints) is a municipality in the São Paulo state o Brazil, foondit in 1546 bi the Portuguese nobleman Brás Cubas. It is pairtially locatit on the island o São Vicente, whilk harbors baith the ceety o Santos an the ceety o São Vicente, an pairtially on the mainland. It is the main ceety in the metropolitan region o Baixada Santista. In 2006, its population wis estimatit at 418,375 (1,476,820 metro aurie). Santos haes the biggest seaport in Laitin Americae, whilk haundelt ower 72 million tons in 2006. It haes lairge industrial complexes an shippin centers, whilk haundle a lairge portion o the warld's coffee exports, as weel as a feck o ither Brazilian exports includin steel, ile, caurs, oranges, bananas an cotton. The ceety is hame tae the Coffee Museum an aw, whare, ance, coffee prices wur negotiatit. Thare is a fitbaa memorial an aw, dedicatit tae the ceety's greatest players, whilk includes Pelé, wha played for Santos Futebol Clube. Its beachfront gairden, 5.335 mts in lenth, figurs in the Guinness Beuk o Records as the lairgest beachfront gairden in the warld. In maugre o the fact that it's juist ootwi the tropics, Santos haes a tropical rainforest climate wi nae real dry saison. Tropical rainforest climates are teepically foond near the equator, sae Santos featurin this teep o climate is an exceptional situation. Aw months o the year averages mair nor 60 mm o rainfaw throu the course o the year. Santos features wairm wather ootthrough the year, tho Juin in Santos is somewha ceuler (an drier) than Januar. The average temperatur in the ceety durin the month o Juin is 23 °C, while the average temperatur in Januar is 28 °C. Precipitation in Santos is appallingly copious, amoontin tae 2,081 mm (81.9 in) annually. Santos lees in ane o the few isolatit regions o Brazil ootside o the tropical Amazon Basin that receive mair nor 2,000 mm (79 in) o tot average precipitation annually, tho naurhaun Ubatuba approximately 140 km (87 mi) tae the ENE is considerably weeter than Santos, receivin an average o 2,645 mm (104.1 in) o precipitation annually. ↑ "Climate Statistics for Santos, Brazil". Retrieved January 7, 2012. Wikimedia Commons haes media relatit tae Santos, São Paulo. This page wis last eeditit on 25 Januar 2019, at 11:01.